The team dinner was in Maggiano's Little Italy, a restaurant located in Santana Row, San Jose's new European-style shopping, dining and entertainment destination. A family-style Italian restaurant, the decor is warm and friendly with rich oak-panelling, hardwood floors and crystal chandeliers. 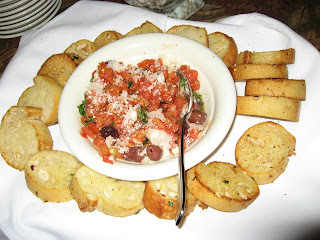 The Bruschetta, Italian garlic bread toasted and topped with a tomato bruschetta relish made of diced tomatoes, balsamic vinegar and roasted garlic, was good. 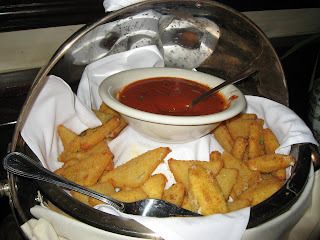 But it was the Mozarella Marinara, whole milk mozzarella cheese breaded and fried,topped with provolone cheese and marinara sauce, that was the absolute delight. Maggiano's salad consisted of iceberg and romaine lettuce, crumbled bleu cheese, crispy Prosciutto, red onions, tossed in their signature House Dressing. 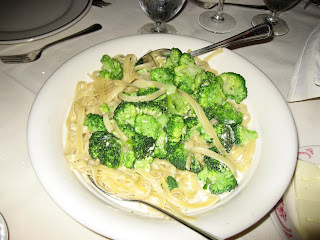 The Fettucine Alfredo was passable, with traditional fettucine noodles tossed with broccoli in a creamy alfredo sauce. The Four Cheese Ravioli was homemade ravioli stuffed with ricotta cheese, cream cheese, mozzarella, and provolone filling sprinkled with house cheese, then browned in the oven and served in pesto-alfredo cream sauce with a touch of marinara. 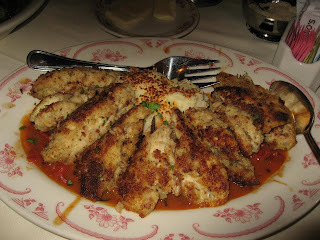 Good stuff, as was the Veal Piccata made of veal cutlets, sauteed and served over aglio spinach. Dinner ended with Tiramisu made from cookies soaked in espresso, coffee liquer layered with mascarpone cheese, dusted with cocoa powder and served with chocolate. @tutubi: You have an advantage over me then, since I haven't ever travelled to the Philippines. @harekrishnaji: Long time since you were here! @sig: Heh, garlic! Unfortunately, I love some garlic-intensive dishes too.